By registering and / or visiting our site you are agreeing to be bound by the following terms and conditions. We may change these terms and conditions at any time. Your continued use of Beststockanalysis.co.in means that you accept any new or modified terms and conditions that we come up with. Please re-visit the `Terms & Conditions' link at our site from time to time to stay abreast of any changes that we may introduce. 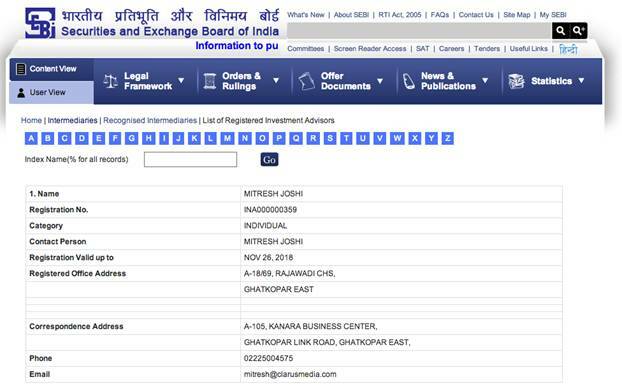 The term 'Beststockanalysis.co.in' is used through this entire Terms & Conditions document referring to Mr. Mitresh Joshi (SEBI Registered Investment Advisor- Registration No INA000000359), the owner of Beststockanalysis.co.in website. By registering, you certify that all information you provide, now or in the future, is accurate. You agree to get regular SMS alerts of the information displayed under the website. You agree to get periodic newsletters, if any. Beststockanalysis.co.in, hereby grants you a limited, non-exclusive, non-assignable and non-transferable license to access Beststockanalysis.co.in provided and expressly conditioned upon your agreement that all such access and use shall be governed by all of the terms and conditions set forth in this USER AGREEMENT. Beststockanalysis.co.in as well as the design and information contained in this site is the valuable, exclusive property of Beststockanalysis.co.in, and nothing in this Agreement shall be construed as transferring or assigning any such ownership rights to you or any other person or entity. All stock call information on Beststockanalysis.co.in is the proprietary, confidential property of Beststockanalysis.co.in and cannot be repeated for any reason outside the Beststockanalysis.co.in. You agree not to repeat or rebroadcast in any way any of the stock idea/call information made on Beststockanalysis.co.in for any reason whatsoever. You agree that if you do repeat or re-post any of Beststockanalysis.co.in calls by any mean, you will be liable for actual and punitive damages as determined by Beststockanalysis.co.in and additional damages to be determined by a Indian court of Law. You may not resell, redistribute, broadcast or transfer the information or use the information in a searchable, machine-readable database unless separately and specifically authorized in writing by Beststockanalysis.co.in prior to such use. You may not rent, lease, sublicense, distribute, transfer, copy, reproduce, publicly display, publish, adapt, store or time-share Beststockanalysis.co.in, any part thereof, or any of the information received or accessed there from to or through any other person or entity unless separately and specifically authorized in writing by Beststockanalysis.co.in prior to such use. In addition, you may not remove, alter or obscure any copyright, legal or proprietary notices in or on any portions of Beststockanalysis.co.in without prior written authorization Except as set forth herein, any other use of the information contained in this site requires the prior written consent of Clarus Media Solutions (P) Ltd. and may require a separate fee. Neither Beststockanalysis.co.in (including its and their directors, employees, affiliates, agents, Stock Analysts, representatives or subcontractors) shall be liable for any loss or liability resulting, directly or indirectly, from delays or interruptions due to electronic or mechanical equipment failures, telephone interconnect problems, defects, weather, strikes, walkouts, fire, acts of God, riots, armed conflicts, acts of war, or other like causes. Beststockanalysis.co.in shall have no responsibility to provide you access to Beststockanalysis.co.in while interruption of Beststockanalysis.co.in is due to any such cause shall continue. The contents, information, software, products, features and services published on this web site may include inaccuracies or typographical errors. Changes are periodically added to the contents herein. Beststockanalysis.co.in and/or its respective suppliers may make improvements and/or changes in this web site at any time. This web site may be temporarily unavailable from time to time due to required maintenance, telecommunications interruptions, or other disruptions. Beststockanalysis.co.in (and its owners, suppliers, Stock Analysts, consultants, advertisers, affiliates, partners, employees or any other associated entities, all collectively referred to as associated entities hereafter) shall not be liable to user or member or any third party should Beststockanalysis.co.in exercise its right to modify or discontinue any or all of the contents, information, software, products, features and services published on this website. Beststockanalysis.co.in and/or its respective associated entities make no representations about the suitability of the contents, information, software, products, features and services contained on this web site for any purpose. All such contents, information, software, products, features and services are provided "as is" without warranty of any kind. Beststockanalysis.co.in and/or its associated entities hereby disclaim all warranties and conditions with regard to these contents, information, software, products, features and services, including all implied warranties and conditions of merchantability, fitness for a particular purpose, title, non-infringement, and availability. In no event shall Beststockanalysis.co.in and/or its associated entities be liable for any direct, indirect, punitive, incidental, special or consequential damages arising out of or in any way connected with the use of this web site or with the delay or inability to use this website, or for any contents, information, software, products, features and services obtained through this web site, or otherwise arising out of the use of this web site, whether based on contract, tort, strict liability or otherwise, even if Beststockanalysis.co.in or any of its associated entities has been advised of the possibility of damages. Stock trading is inherently risky and you agree to assume complete and full responsibility for the outcomes of all trading decisions that you make, including but not limited to loss of capital. None of the stock ideas from Beststockanalysis.co.in should be construed as an offer to buy or sell securities, nor advice to do so. All Stock ideas/comments and posts made by Beststockanalysis.co.in and employees/owners/Stock Analysts are for information purposes only and under no circumstances should be used for actual trading. Under no circumstances should any person at this site make trading decisions based solely on the information discussed herein. It is informational in nature. You should consult a qualified broker or other financial advisor prior to making any actual investment or trading decisions. You agree to not make actual stock trades based on comments/stock ideas on the site, nor on any techniques presented nor discussed in this site or any other form of information presentation. All information is for educational and informational use only. You agree to consult with a registered investment advisor, which we are not, prior to making any trading decision of any kind. Hypothetical or simulated performance results have certain inherent limitations. Unlike an actual performance record, simulated results do not represent actual trading. No representation is being made that any account will or is likely to achieve profits or losses similar to what may be shown in the examples if any. All Forums are public and not private communications. Chats, postings, conferences, and other communications by other users are not endorsed by Beststockanalysis.co.in, and such communications shall not be considered reviewed, screened, or approved by Beststockanalysis.co.in. Beststockanalysis.co.in reserves the right for any reason to remove without notice any contents of the Forums received from users, including without limitation message board postings. You acknowledge that Beststockanalysis.co.in is provided to you on an "as is, with all faults" basis. Beststockanalysis.co.in expressly disclaims any and all warranties, whether express, oral, implied, statutory or otherwise, of any kind to the users and/or any third party, including any implied warranties of accuracy, timeliness, completeness, merchantability and fitness for a particular purpose, as well as any warranties arising by virtue of custom of trade or course of dealing and any implied warranties of title or non-infringement. In addition, Beststockanalysis.co.in and Stock Analysts in providing the stock ideas and/or information makes no endorsement of any particular security, martket participant, or brokerage. Further, Beststockanalysis.co.in does not represent or warrant that it will meet your requirements or is suitable for your needs. Under this User Agreement, you assume all risk of errors and/or omissions in Beststockanalysis.co.in, including the transmission or translation of information. You assume full responsibility for implementing sufficient procedures and checks to satisfy your requirements for the accuracy and suitability of Beststockanalysis.co.in, including the information, and for maintaining any means, which you may require for the reconstruction of lost data or subsequent manipulations or analyses of the information under the User Agreement. You agree that Beststockanalysis.co.in (including its and their officers, directors, employees, affiliates, stockbrokers, group companies agents, representatives or subcontractors) shall not in any event be liable for any special, incidental or consequential damages arising out of the use or inability to use Beststockanalysis.co.in for any purpose whatsoever. Beststockanalysis.co.in and it's affiliates, officers, directors, employees and agents shall have no liability in tort, contract, or otherwise to user and/or any third party. Best Stock Analysis or any of its associates or agency appointed by it may use the contact number of the customer to notify them further about the services and products of the Company. The links in this site will allow you to leave Beststockanalysis.co.in. The linked sites are not under the control of Beststockanalysis.co.in. Beststockanalysis.co.in has not reviewed, nor approved these sites and is not responsible for the contents or omissions of any linked site or any links contained in a linked site. The inclusion of any linked site does not imply endorsement by Beststockanalysis.co.in of the site. Third party links to Beststockanalysis.co.in shall be governed by a separate agreement. If there is any conflict between this User Agreement and other documents, this User Agreement shall govern, whether such order or other documents is prior to or subsequent to this User Agreement, or is signed or acknowledged by any director, officer, employee, representative or agent of Beststockanalysis.co.in. If Clarus Media Solutions (P) Ltd. takes action (by itself or through its associate companies) to enforce any of the provisions of this User Agreement, including collection of any amounts due hereunder, Clarus Media Solutions (P) Ltd. shall be entitled to recover from you (and you agree to pay), in addition to all sums to which it is entitled or any other relief, at law or in equity, reasonable and necessary attorney's fees and any costs of any litigation. This User Agreement constitutes the entire agreement between the parties, and no other agreement, written or oral, exists between you and Beststockanalysis.co.in. By using the Information on Beststockanalysis.co.in, you assume full responsibility for any and all gains and losses, financial, emotional or otherwise, experienced, suffered or incurred by you. Beststockanalysis.co.in does not guarantee the accuracy, completeness or timeliness of, or otherwise endorse in any way, the views, opinions or recommendations expressed in the Information, does not give investment advice, and does not advocate the purchase or sale of any security or investment by you or any other individual. The Information is not intended to provide tax, legal or investment advice, which you should obtain from your professional advisor prior to making any investment of the type discussed in the Information. The Information does not constitute a solicitation by the information providers, Beststockanalysis.co.in or other of the purchase or sale of securities. The service is provided "as is," without warranty of any kind, either express or implied, including without limitation, any warranty for information, data, services, uninterrupted access, or products provided through or in connection with the service. Specifically, Beststockanalysis.co.in disclaims any and all warranties, including, but not limited to: (i) any warranties concerning the availability, accuracy, usefulness, or content of information, products or services; and (ii) any warranties of title, warranty of non-infringement, warranties of merchantability or fitness for a particular purpose. This disclaimer of liability applies to any damages or injury caused by any failure of performance, error, omission, interruption, deletion, defect, delay in operation or transmission, computer virus, communication line failure, theft or destruction or unauthorized access to, alteration of, or use of record, whether for breach of contract, tort, negligence, or under any other cause of action. Neither Beststockanalysis.co.in nor any of its employees, agents, successors, assigns, affiliates, Stock Analysts, group companies or content or service providers shall be liable to you or other third party for any direct, indirect, incidental, special or consequential damages arising out of use of service or inability to gain access to or use the service or out of any breach of any warranty. Because some countries do not allow the exclusion or limitation of liability for consequential or incidental damages, the above limitation may not apply to you. In such countries, the respective liability of Beststockanalysis.co.in, its employees, agents, successors, assigns, affiliates, group companies and content or service providers? respective liability is limited to the amount provided under said law. Further, you agree and understand that all services provided are non-refundable and that you should carefully consider whether our services are able to meet your needs. You agree to keep the information received from the Beststockanalysis.co.in and services CONFIDENTIAL and will NOT Disclose the knowledge gained to other any person or firm for any reason. You hereby consent to the Jurisdiction of the Courts of Mumbai, India with respect to violation of any part of this Agreement. You expressly agree that you will be financially liable for actual and punitive copyright infringement and loss-of-business damages awardable to Clarus Media Solutions (P) Ltd. and/or its associate companies if you derive any or all of your income from a stock or financial-services related web site and/or we find that you have copied, made derivative works from, or in any other way duplicated the proprietary information located on Beststockanalysis.co.in web servers and/or web site (including but not limited to graphics, trading systems and methods etc). The information and commentaries are not meant to be an endorsement or offering of any stock purchase. Principles and employees of Beststockanalysis.co.in do not represent themselves as acting in the position of an investment advisor, broker, or investment manager for the use of the information in this service. This User Agreement and the license rights granted hereunder shall remain in full force and effect unless terminated or cancelled for any of the following reasons: (a) immediately by Beststockanalysis.co.in for any unauthorized access or use by you (b) immediately by Beststockanalysis.co.in if you assign or transfer (or attempt the same) any rights granted to you under this Agreement; (c) immediately, if you violate any of the other terms and conditions of this User Agreement. Termination or cancellation of this Agreement shall not affect any right or relief to which Beststockanalysis.co.in may be entitled, at law or in equity. Upon termination of this User Agreement, all rights granted to you will terminate and revert to Beststockanalysis.co.in. Except as set forth herein, regardless of the reason for cancellation or termination of this User Agreement, the fee charged if any for access to Beststockanalysis.co.in is non-refundable for any reason. The term 'Best Stock Analysis' or 'us' or 'we' refers to the owner of the website whose corporate office is 122-B Wing, Mittal Court, Opp Vidhan Bhavan, Nariman Point, Mumbai - 400 021. Our company registration number is U22222MH2010PTC206772 and registered place is Mumbai. The term 'you' refers to the user or viewer of our website. You may not create a link to this website from another website or document without Best Stock Analysis's prior written consent. Best Stock Analysis does not have any refund or cancellation policy. Services once sold will not be cancelled or refunded under any circumstances. The information contained in this website is for general information purposes only. The information is provided by Best Stock Analysis and while we endeavour to keep the information up to date and correct, we make no representations or warranties of any kind, express or implied, about the completeness, accuracy, reliability, suitability or availability with respect to the website or the information, products, services, or related graphics contained on the website for any purpose. Any reliance you place on such information is therefore strictly at your own risk. Through this website you are able to link to other websites which are not under the control of Best Stock Analysis. We have no control over the nature, content and availability of those sites. The inclusion of any links does not necessarily imply a recommendation or endorse the views expressed within them. Every effort is made to keep the website up and running smoothly. However, Best Stock Analysis takes no responsibility for, and will not be liable for, the website being temporarily unavailable due to technical issues beyond our control.